The World Wide Web Conference in 2014 gathered some of the major names in the Web technologies industry from around the world. Their presentations offered inspiring insight to the things we encounter every day but care so little about their complexity and the way of functioning. 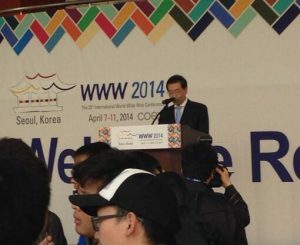 Keynote speakers on the World Wide Web Conference in 2014 included most prominent figures such as Prof. Christos Faloutsos from Carnegie Mellon University, Dr. Jong-Deok Choi from Samsung Electronics and Samsung’s Software R&D Center (SWC) and Dr. Qi Lu from Microsoft. The trio held speeches on several different topics including the issue of patterns, cascades, fraud detection, taming the Web and organization of the digital world. Keynote speakers were asked to give an hour-long lecture where they will present their studies and explain those processes in a simple way. The World Wide Web Conference in 2014 was also supported by presentations by some other featured speakers such as employees in some of the biggest companies in the industry. The fascinating presentations were also held by experts such as Asish Goel from Twitter, Andrew Kirmse from Google and Yoelle Maarek from Yahoo Research also had their presentations. There were also David K. Min from LG Electronics, Pavel Serdyukov from Yandex as well as Hugh Williams from Pivotal, Ramesh Sitaraman from Umass and Jan Pedersen from Microsoft. This conference also presented some of the keynote speakers from BIG2014 and W4A such as AT&T´s Executive Director of the Statistics Research Department Chris Volinsky, Cloudera´s CTO Amr Awadallah and Japanese computer scientist at IBM Research, Chieko Asakawa. Furthermore, there were Cha, Sang Kyun from Seoul Nat´l University, Kun-pyo Lee from a public research university KAIST and Sang-Mook Lee from Seoul National University. 2014 Conference also included some Workshops with some of the experts employed in major Web technology companies and Universities around the world. Workshops presented speakers such as Sören Auer from Rheinische Friedrich-Wilhelms-Universität Bonn and IAIS, Kevin Chang from the University of Illinois at Urbana-Champaign, Markus Strohmaier from the University of Koblenz and GESIS and Joseph Gonzalez from the University of California, Berkeley. There were also speakers from companies such as Yahoo! Labs, Google and IBM Research such as research scientist Changsung Kang at Yahoo! Labs and his colleague from Barcelona branch, computer scientist Daniele Quercia. Workshops included presentations by Xin Luna Dong, a research scientist at Google, and Michelle Zhou, analytics specialist at IBM Research in Almaden.